Our mission is to save lives by creating safe drivers. We are passionate about driver safety, and we do everything we can to help our students make the right decisions on the road. If you would like to schedule lessons or learn more about our program, please contact us today. We will be glad to hear from you. 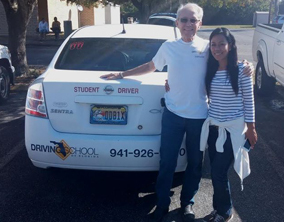 Driving School of Florida has always maintained the highest standards in training, customer service and satisfaction. We believe in giving our students the best. While you can always take our word for it, you don’t have to. Read what some of our students are saying about us online! Please help us spread the word and leave your review on one of the sites below, thank you!